You are not going to believe this, but all has been quiet here on Henny Penny Lane for a few day! Three days now without rain. Imagine that! We've had sunshine too, and no more trees falling. Friday I raked leaves for four straight hours. On Saturday, I raked leaves for three hours. Today we have wind! What is it about raking leaves that makes the wind blow? I was trying to get a picture of the Flag blowing in the wind. What a beautiful day this has been! Would you just look at Smokey. Is he not the cutest thing? It's always good to see green again after all this brown. I at least made a dent in the leaves. Just a word about our Thanksgiving. It was a nice day, but quiet. We missed having Lynn and Andee and their families. Beat, pour into 2 quart greased dish. Both casseroles are really good. Too good! All the babies were wet and cold, some had gotten out. Good grief! After catching those on the outside, I searched around and found another tarp in the shop. Even with the wind fighting me, I managed to throw the tarp across one corner of the crushed pen. I then tied it to the fence in several places. I'm telling you what, when I saw this tangled mess I did not know what to do first...what with the rain and the wind! Hopefully, they can live in this corner until I get the other pen ready. I am surprised that the mother guinea and all the babies survived. Even the heat lamp is still burning in the corner. But wait, that's not all. All this time taking care of the guineas, Eli had been running and playing in the mud and rain! Oh my gosh! Don't know why I thought he deserved a treat. Maybe for not getting any dirtier than he did. :( Pardon my muddy sleeve and arm and cold red fingers. For Eli, it was all fun and games. I was exhausted!!! his blankets in the washer. Hope you all had a happy Thanksgiving day. I should be posting about Thanksgiving food and stuff but will try to do that tomorrow. Just had to share the story about the tree falling. I hate those old miniature wishing wells that don't look real. Poppy says he is having someone build us another. I spoke up right quick and said well tell him to build it square and use wide boards and build a top with an overhang and a tin roof and a roller for hanging the old well bucket. If it doesn't look authentic, I don't want it! I can't wait to light a fire under this pile of stuff. for washing up and there was also a towel hung from another nail. Those truly were the good times. Oh well, moving on to more modern times. Oh this rain! The pond is running over again and the pier is completely under water. Guess it's just as well that we have no family coming for Thanksgiving dinner tomorrow. Yep, just Poppy and me. Still, I plan to bake a turkey, have dressing, broccoli casserole, sweet potato casserole, cranberry sauce, collards, and rolls. Poppy said since it is just the two of us, let's have only our favorite dishes. No need making mashed potatoes and gravy, or green beans and corn. We have those things enough anyway. So, I will wish all of you a happy Thanksgiving! Thank you for stopping by. Once again we have leaves covering the ground. Leaves as far as the eye can see. Eli gave me a scare yesterday. He is fine, but let me say this...there will be no more big ten dollar bones brought into this house. After a call to Quail Ridge Animal Hospital in Raleigh, I made a trip in to town to buy a bottle of Miralax. A ten dollar bottle of Miralax just for a one, half a teaspoon dose. Thankfully, no emergency visit was necessary! I settled down after Eli scared me half to death only to realize that we have no running water in the house. Why does everything wait until Sunday to happen? Nobody comes out to do work like that on the weekend. Especially not on a Sunday. 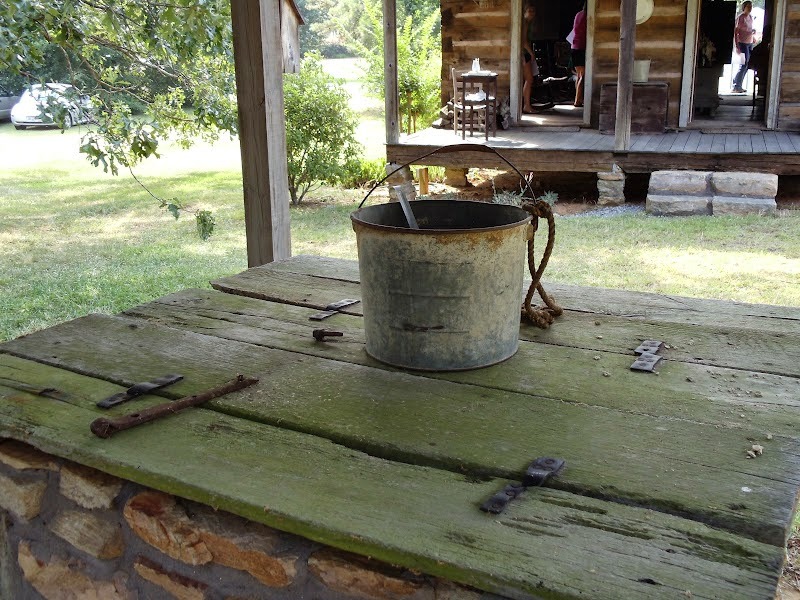 We get our water from a well. Something probably gone haywire with the pump. So then this morning I find this little fellow. He somehow got outside the safety of the pen and spent the night alone in the cold, dark, and rain. I found him this morning, very cold and lifeless. I have him in my lap wrapped in a warm tee shirt as I type. I'm thinking he will be okay once he warms up. It surprises me that nothing caught him during the night. So this is my Monday morning...waiting for the well drilling, pump repair people to get here while carrying around a cold baby guinea wrapped in warm cloths in one hand and doing what little I can with the other. The house is a mess and the dish pan is running over with dishes from supper last night. Guess I had better get busy. Thank you for visiting. Would you just look at the difference! I can't let it get this bad again. Poppy, on his way to the woods, suggested we box up all this stuff and sell it when we have a yard sale. I'm telling you! Time flies! Yesterday was spent buying groceries, picking up prescriptions and feed for the animals. I also stopped by Lowes and bought five more T-posts for my fence building project. Today was spent building Bun Bun a bigger house. So, there has been no time to read my favorite blogs and no time to reply to the nice comments on my last post. We simply need more hours in the day. Better get off this computer. Thank you for visiting. Is this not typical? I drug the ladder to the center of the living room and started that dreaded job of dusting...beginning with the ceiling fan. I'm way up there, one step from the top with my dust rag, and hear that retching sound of a cat throwing up. "Bickett"! "Not on the carpet"! I'm careful on ladders these days. Getting down is slow. Bickett has always been one of those cats! I got that mess cleaned up, then back to the ceiling fan, and on to the TV cabinet. Tomorrow hopefully I will start on that darn bottle collection. Up and down that ladder with a handful of glass bottles! I want this living room clean before Christmas! I've brought the ladder inside but keep putting off this big job of dusting. Collections are fun but not when it comes times to dust! I dare not show you the entire collection...well maybe a small picture at the bottom. These old blue canning jars remind me of Grandma Comer. I distinctly remember seeing her open a jar of pickled beets and I remember blackberries canned in jars like these. 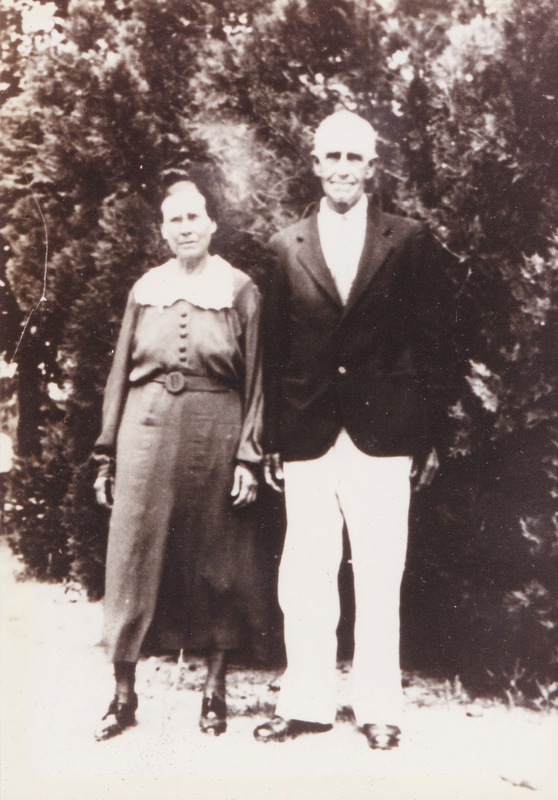 This is my Grandma and Grandpa Comer. Grandpa died ten days before I was born. The house was beautifully built...hard to explain, but a covered porch was across the back of the house, which went across a center section where there were bedrooms, then turned and extended across the front of the kitchen. The kitchen is the roof section you can see in the back. Like a box with one side cut out. The barn. The paved road used to be a dirt path separating the house from the barn. If I were fortunate enough to own this place, I would live here. Okay, enough for today! As mama used to say, "I have simply got to get busy"! Thank you for visiting. It is Poppy's turn to dust! Can you believe how fast the days go by? Can you believe this weather? Can you believe these cold temperatures so early in the season? We had snow flurries last week...and woke up on Saturday morning to a cold 23 degrees! I need to check on Shelby and Jimmy. They were at the farmer's market again in that 23 degrees! And, if all that isn't enough, we could have thunderstorms later today! Daddy used to brag on Shelby, that she was not afraid of the devil. He was proud of that fact. Wonder if it had anything to with mama and me being so terribly afraid of everything. Daddy used to tell people that Shelby had read the entire set of encyclopedias. When recently I asked her if that was true, she said, nah. She probably has read the entire set. The calves were in a group playing. This one baby had gotten over in the hay ring. Jimmy shooed him out to be sure he wasn't hung in there. The bull was eating alone over to the left. That cow was probably thinking, "and he can just stay alone too"! Need to get busy. Here it is Monday. Poppy has gone back to work after another nine day vacation. The TV is shut off and cooling down. Oh, Poppy did see a good size buck late Saturday, right at the edge of dark. As Poppy put it, "I may regret it, but I let him walk". Poppy does have a kind heart. The deer have struggled what with that disease killing off so many of them. Kitty and more leaf pictures!